You are here: Home » Austrian wine, it’s what’s for Christmas! Austrian wine, it’s what’s for Christmas! Whether you like white wine, red wine, bubbly wine or dessert wine… Austrian wine is surely a good choice for a holiday crowd pleaser. Gruener Veltliner: a versatile grape not only in its ability to pair with food, but in style. Gruener Veltliner can range from light, peppery citrus to full-bodied, fruitful and off-dry… either way you’ll always get a TON of acid, which is perfect for heavy Christmas fare. Why not try a Smaragd Gruener Veltliner from the Wachau, an entry level Gruener Veltliner from the Kamptal and a Gruener Veltliner blend of Gemischter Satz from Vienna this holiday? Riesling: An increasingly favorite grape of the masses… but don’t worry, you won’t find any unexpected sweetness here. Austrian Riesling is traditionally bone dry. Refreshing after four too many cookies. Try one of these from the Wachau to see why Austriai is considered to be among the elite of Riesling. Rotgipfler/Zierfandler: Looking to shock that wine snob cousin? Why not try something deliciously exotic? Smokey, minerally, and absolutely perfect for that traditional seafood Christmas eve dinner you’re serving. Try them on their own or in a traditional Austrian blend In Gumpoldskirchen named for the town in which it originated. Of course there are many other white grapes that are delectable, but as not to overwhelm you too much, we’ll move on to the reds. Pinot Noir: That’s right, Austrian Pinot Noir is quite delicious and relatively priced. Spice, fruit, luscious mouth feel… perfect company for the cloves poked into the ham or the figgy pudding, Try something from Southern Austria. On that note, St. Laurent: a relative of Pinot Noir, but with a little extra umph in the fruit. Great company for Christmas dinner, this wine can stand up to the roast beast. Finally, Zweigelt a crossing of Blaufrankisch (Austria’s other indigenous red grape, known as Lemberger in certain vineyards of the US) and St. Laurent so it still has a bit of spice to it, like Pinot Noir, but also a bit of earth tones. Like St. Laurent, Zweigelt is traditionally great for meal time. However, like Gruener Veltliner this grape shows intense versatility of style so opt for a light bodied Zweigelt and it can easily be served as an apertif. For the sparkling wine, skip the Champagne this year and opt for some Sekt (this is perfect for New Years Eve too!) Austrian Sekt can be made from a variety of grapes ranging from Pinot Noir to Gruener Veltliner to Welsh Riesling to a sparkling Gemischter Satz… all depends on your flavor profile preferences… no matter what though, it’s most likely delicious. Now onto dessert. Austrian dessert wines are classified by the Prädikatswein system, similar to that used in Austria. Austrian dessert wine classifications include BA, Ausbruch, TBA, Eiswein (made from frozen grapes) and Strohwein (made from dried grapes.) These wines weren’t tagged, “liquid gold” for nothing! Unlike some other wines they share the dessert category with, Austrian dessert wines are heavily balanced by the intense acidity of the grapes leaving a delightful finish without an overpowering sweetness. These wines can be made from a variety of grapes, but dessert wines of Austria are most notably from the southern regions of Austria. So there ya go – something for everyone at every part of the meal… what are you waiting for?! 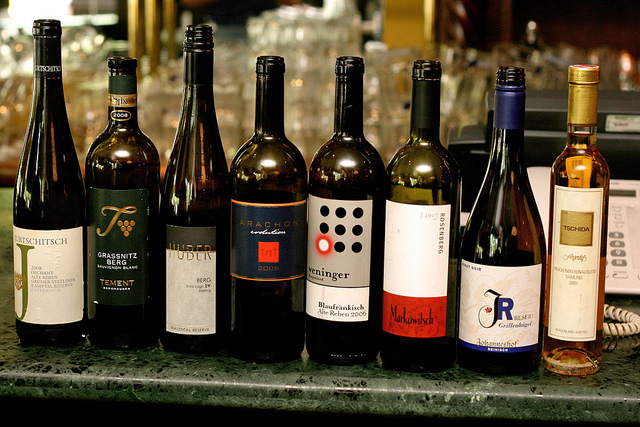 Go get some Austrian wine and WOW your friends!